Okay, it’s official, I’m getting addicted to something good for me!!! Right now, I’d rather have this than chocolate!!! It tastes so refreshing and makes me feel alive. First of all, sorry to say, you need a juicer. I do recommend you get one and that you use it! Don’t be like me and my husband who have had one kicking around for almost 25 years and barely used it! Well, we’re making up for it now! Juicing is a great way to give your body a large blast of nutrients, something most of us need on our average Canadian diet. 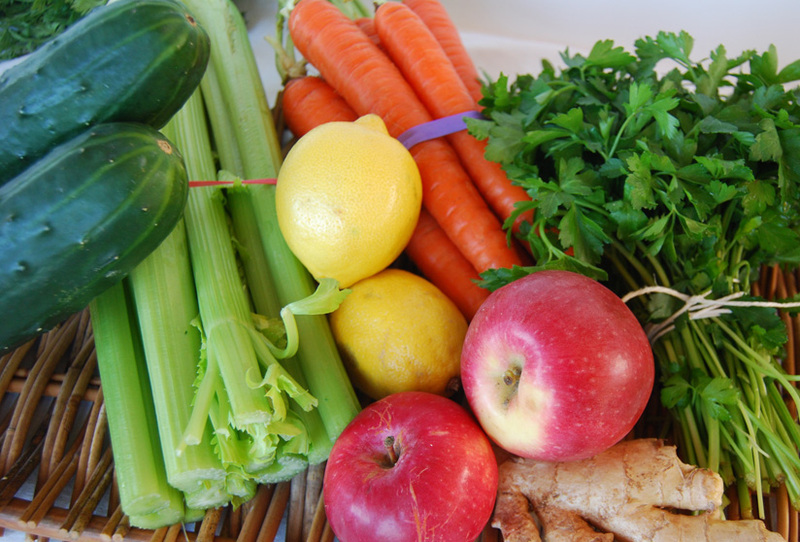 Juice has no fibre so goes right into the blood stream to give your cells a much needed boost. It’s best to drink it freshly made and on an empty stomach. Basically, what we’ve been doing lately is making a juice with mostly greens – kale, Swiss chard, and bok choy for example, then putting some cucumber and celery for their cleansing properties and apple and carrot for a bit of sweetness, but the secret ingredients to make it taste awesome is a chunk of ginger – good for digestion and some lemon which is very alkalising. You can play around all you like with different ratios and ingredients, but I’ve found the lemon and ginger really make it taste great! Here’s a tip – today I juiced the stalks from my broccoli and the stems of some greens that I’d used the leaves for in a green smoothie. Don’t waste those stems – juice ’em! Drink a glass of this stuff a day and keep the Doctor away!